We are delighted to offer Intelligent Value Subscribers a one month FREE trial to our Advisors Sentiment report. Please note that your credit card details will NOT be taken. This survey has been widely adopted by the investment community as a contrarian indicator and is followed closely by the financial media. Since its inception in 1963, our indicator has a consistent record for predicting the major market turning points. We study over a hundred independent market newsletters and assess each author’s current stance on the market: bullish, bearish or correction. Since we have had just four editors since inception, there has been a consistent approach to determining each advisors stance and his prior viewpoint. Our weekly sentiment data runs consistently back to the 1960’s. Current readings are put into context against historic precedents. We don’t necessarily take a contrarian view to the newsletter writers in our survey. A large part of the time our sentiment readings remain neutral. 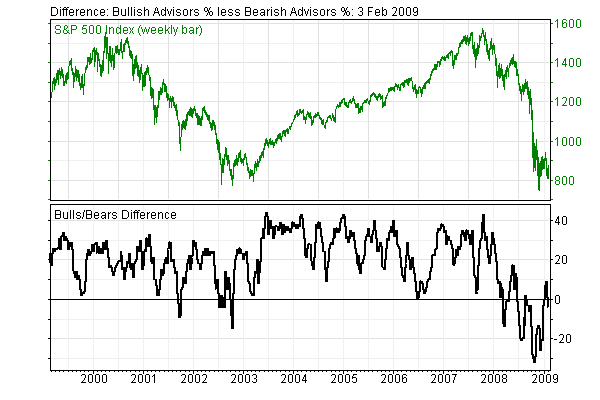 We consider the norm to be 45% bulls, 35% bears and 20% neutral. However, we do pay attention to extreme readings in both bulls and bears and also to historically significant runs of more bulls than bears. To summarize, advisors are only wrong when you get too many of them start thinking the same thing. Just click here now to get your one month FREE trial to this service! Please note that your credit card details will NOT be taken.